Simon Says Stamp One of a Kind Release Blog Hop! I am so thrilled to join Simon Says Stamp for their One of a Kind release Blog Hop. This release is awesome with some gorgeous stamp sets, innovative dies, two new ink pads and embellishments. This is my first release blog hop with Simon Says Stamp. Squeal! So happy to be invited for the blog hop. Thank you so much for the invitation and generosity Heidi. I have three cards using one of the new stamp sets and coordinating dies called So Cool. My first card using the popsicle border stamp image and coordinating dies. I trimmed five white cardstock to 1″ x 4.25″ in size. Sponged each of the strip with Simon Says Stamp dye inks – Audrey Blue, Melon, Jellybean, Hollyhocks and Sunshine. Then stamped the popsicles border image using black ink on each of the strip. Then used the coordinating dies to die cut them all out. To add some depth to the images, I used copic markers in a slightly darker shade in certain areas of the image. I adhered these on a fog wonky stitched rectangle panel using foam adhesives. I adhered this panel on a white card base. The sentiment is simply stamped using black ink, trimmed and adhered as shown. Then I added glossy accents to some of the popsicles. The second card is a bit more artsy. It is simple easy to make and I love it. I stamped the popsicles using Antique Linen distress ink and watercoloured them using Zig Clean Color brush markers. Once dry, I die cut them out using the coordinating dies. One a white card base, I spattered Black Soot distress inks. Then stamped the sentiment using grey dye ink in the middle of the card front. Then adhered the popsicles using foam adhesives. To add texture and interest, I added some Nuvo Jewel and Crystal drops and sequins from Vintage Chic sequins. Finally, this is my favourite of all three I should say. You will know why seeing the card. I love bright colours period! I die cut a few popsicles out of masking paper and adhered randomly on the card front. I burnished them using the bone folder because I sponged Simon Says Stamp Audrey Blue and Soft Navy dye inks. Soft Navy adds depth to a rather flat Audrey Blue background. I then removed the masks. Stamped the popsicles image using Simon Says Stamp Intense Black ink. Then I coloured the popsicles using copic markers. I also added some highlights using Sakura white gelly roll pen and shimmer using Wink of Stella clear shimmer. The sentiment is simple white heat embossed on black strip of cardstock and adhered using foam adhesive. Added some Sparkly Clear sequins to the card to finish it off. I love the summer colours and contrast on this card. Simon Says Stamp is giving away $25 coupon at every stop along the hop. So make sure you leave comment on all the stops in this blog hop. Winners will be announced on Monday. 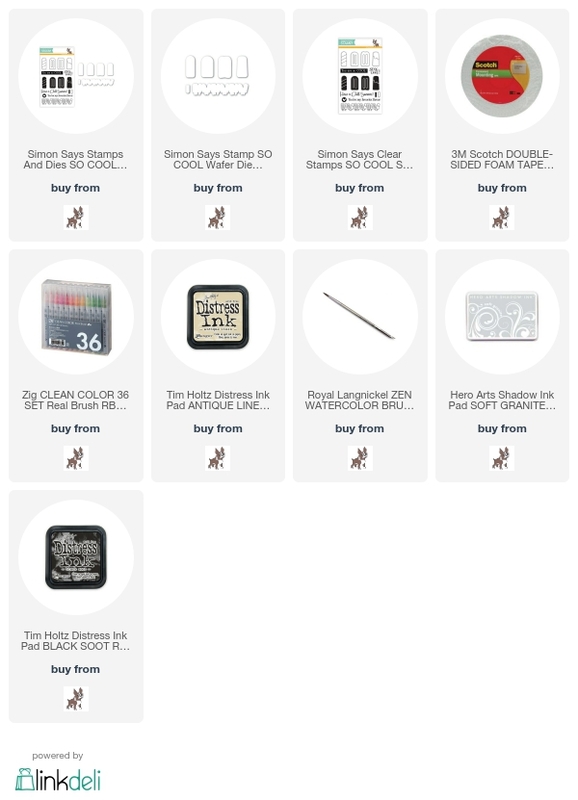 Here is the blog hop order. Fabulous cards! I love that you showed several different ways to use the same stamp set. Really great inspiration. 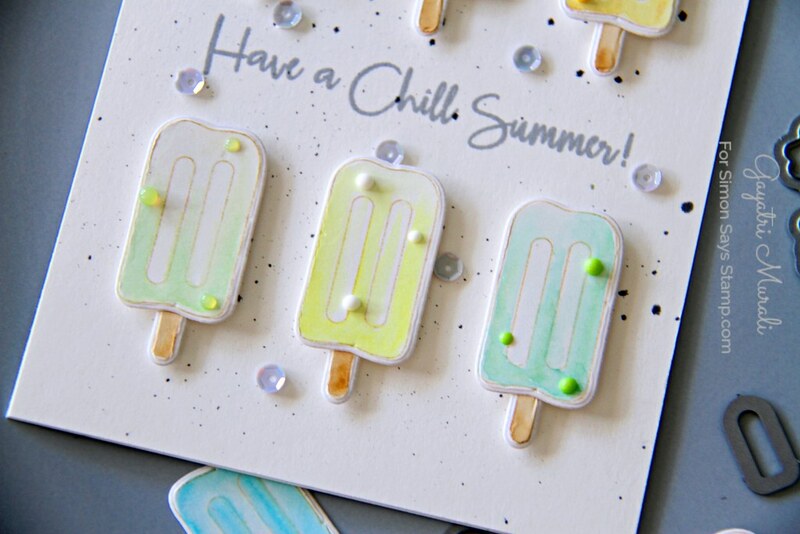 Chillin’ fantastic with border dies, pastel colors of the indiv popsicle dies and wonderful bright colors. Wow your popsicle cards are so inspiring. Love how different they all are despite the same theme. Thanks for the hint about using navy over Audrey blue. Your background is fantastic! Well, all the cards are really! I love each of these cards. The soft pastels and the bold colors in the third one are just awesome. Thanks for the inspiration. There ardd so many new products, but these popsicle are still my favorite. 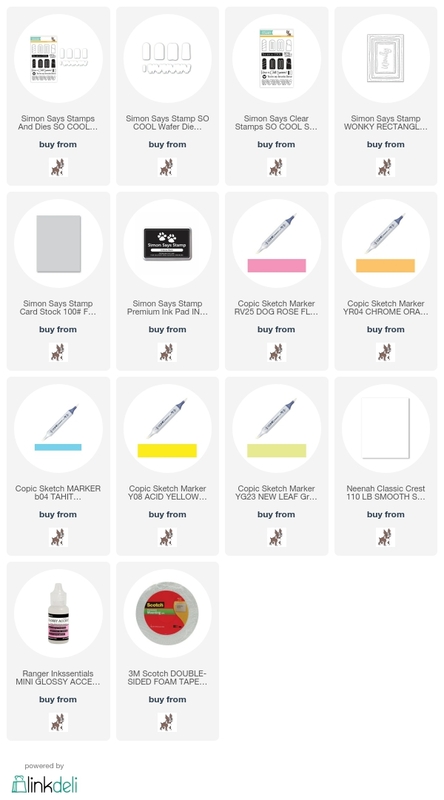 Again, another reason to break down and get the zig watercolor set. I can’t decide if I like the pastel pops best or the last vibrant card best. Sooo pretty! These look juicy good – ordered my stamps and can’t wait! I love this stamp set & the bright colors of your 3rd card definitely has my heart as well! LOVE all 3 of these super cute popsicle cards!!!!! FAB! Wow, what great uses for this set! I love that each card is a different look. You are so talented! My favorite is a toss-up between the first and second cards, but all of them are awesome! Your favorite card is mine, as well! I love the bright colors and Audrey blue background! Your coloring is beautiful! I like the way that you made each card look different but used the same die and stamp sets for each one. Now I am really in the mood for a popsicle! This definitely says Summer to me. Thanks for sharing your artwork! Those are gorgeous and the last one is my favorite, too. I love the bright colors and the little bit of white around the edge of each image. It really makes them pop. Love how you demonstrated the versatility of this set. I can’t pick a fave! Congratulations on your first blog hop! You did a fantastic job of inspiring us with this stamp set. Your cards are gorgeous. Great job. Love, love, love them all!! Three cards each with dynamic coloring inspiration. 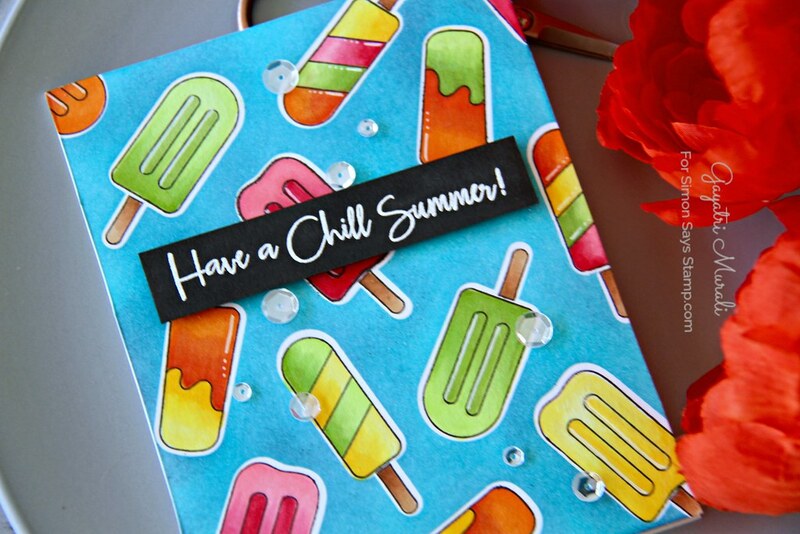 you have created such wonderful cards with the popsicle stamps, Gayatri – clever, colorful and artsy – love them! Loved all three cards but the simplicity of the second one makes it my favourite. Fun, fun fun cards. All of them. Your cards are so very cute and remind me of picnics and Summer fun. Great fun cards for summer, love all the bright colors! Wow! all three of your designs are so amazing! I love that each one is so unique from the other. I think my favorite is the Copic colored bright one, but I also ADORE the pastel one! So ready for SUMMER! I can see why the last card is your favorite. The coloring is amazing. All three are “cool” but I love the first and last cards with the bright colors. Makes me want to stalk the ice cream truck! Everything looks so cool, refreshing, and yummy!!! Thanks! Three great cards, and yes, number 3 is my favourite too. The colouring is great, looks like real summer-popsicles. Love the second card best. The way you coloured the popsicles with pastel colors is very soft and nice. Great job! I love all 3 of your cards , I’m a bright coloured girl myself so the 3rd card is perfect for me , your first I think would be great for the guys and your second card just immediately made me think of warm summer days and cool floaty clothing and gentle breezes by the sea love all thanks for sharing. These are so very cute. Love the dies! Great cards! I like them all. All cards are gorgeous but the third and brightest one is my favourite! Your popsicles are ALL amazing! The coloring is awesome! Great cards! Love how you used the same set three distinct ways! Especially like the middle card, ready to bite into one of those pops! I love your first and third cards. So much color. So pretty! Wonderful cards! This set is so much fun. Love that you showed so many different ways to use it. Thank you! Love how all the cards screams SUMMER. Fun cards to send for a summer Birthday! All of your popsicle cards are so COOL!!! I absolutely love that last card! They’re all gorgeous but there’s just something to how you set up the background to go around the stamped popsicles that really catches my eye. Beautiful! Your cards are amazing! This set is my favorite from the release. Love seeing all the various ways to use it. Wow! Three beautiful cards with popsicles and all adorable. WOW! These are all so different … one to the other … but each is fabulous! Love the repeat design on the 1st … the yummy creamy dreamsicle look of the 2nd and of course the bold bright ‘yummy in your face’ colors of the 3rd! Awesome inspiration using this fabulous new release! Thanks! All three cards are so fun…love all the colors, especially the boldness of the last card….wow…. Loving your cards and popsicles!! Such a great use of the set!! Nothing says summer, right? I love your colorful cards! We’ve had a hot week and your cards are so COOL. I love the pastel treats! Wow – each card very different from each other, but all are really beautiful. I particularly love the light watercolored card – looks like creamy ice cream on a stick! Amazing! Omigosh! I loose these popsicles and the amazing colors. These are all fantastic!! I do love your third one the best for the same reason…love bright cheerful colors!! You had lots of fun with the Popsicle idea. I adore the soft colors in your second card and I agree with you, the third is my favorite with those pops of color!! I love all three projects but totally agree with you that the third is amazing! I love how vibrant all the colors are. The blue just jumps off the page and those yummy popsicles are beautiful. Super pretty! Glad you were invited to the hop. You did a fantastic job on the cards. 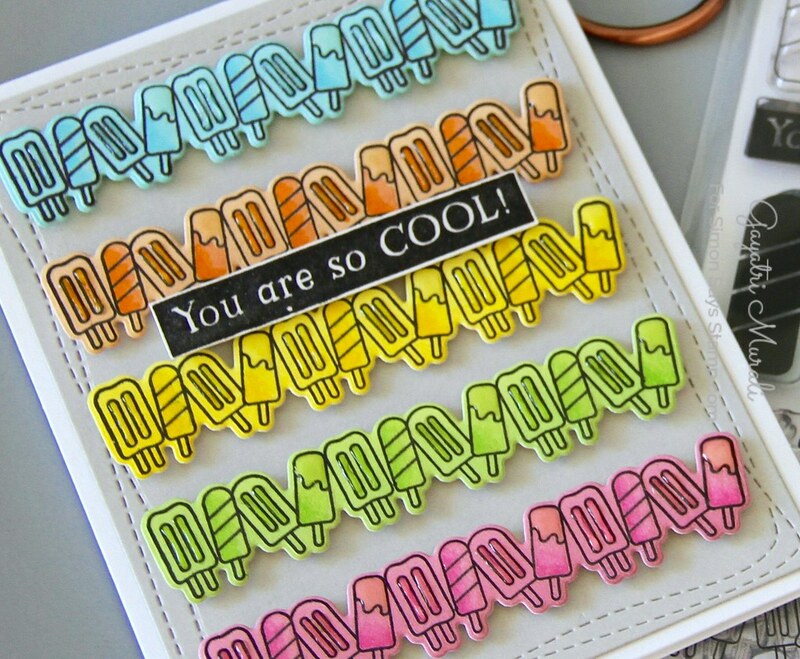 Love all those cards – the popsicles are so colourful and they look delicious and refreshing! these are super fun cute cards. love them all! Love all your bright and cheery cards! I like the pastel popsicles the best. They just have that cool popsicle feel. I love your bursting birthday card too. Oh, my, it does feel like all those flowers are going to come bursting right out of that little window. Fun!!! All of your cards are terrific. I love the way you used the border popsicles and the way you colored them. Such adorable cards – love them all! All of your cards are great, but I agree that the last one is the best! I, too, love bright colors! The lighter color ice cream card is my fav! What great cards. I love your use of the popsicle border. I think I like your “party’s” card the best. IT’s so COOL! Beautiful and so creative with that stamp set, love the pastel colors!!! Love the different looks of each card. Great cards! The second one is my favorite! Congrats on your first post with SSS hop! How exciting! Love how you used your copics on the first card to deepen the colors on one end. Very clever! I can see that you have a great eye for color! Loved how you showed the same stamp set several ways! Thank you for the inspiration! Super cool cards! Love them all! Your favorite is my favorite. They are all so beautiful! Especially like the middle card, but they are all great! I love all three of these fun cards! But, if I have to pick one, I think I would go with the 1st one – those sweet rainbow popsicles. So fun! I love the variety you have with the same themed stamps. The pastel ones are especially lovely. Thanks for sharing! So glad you’re part of this hop! I love how each card uses the same stamp set with very different colors and vibes. Each one is just beautiful! I especially love that soft pastel one but the bold ones are just awesome too. Thanks so much for sharing! Such fun things you can do with this set! Love all your samples. Thanks for sharing. I love the pastel card! And appreciate learning the technique to use masks to create the background on the last card. I love how they each look so unique and colorful. Amazing coloring on them all! Beautiful coloring! Second one is my favorite. Love the dimension you have with cutting out and raising the background images. It makes these cards really pop! Great cards! I loved all 3 of them! Thanks for sharing how they were made! LOVE, LOVE, LOVE your third card with the vibrant colors!!!! Your coloring is so amazing! Great masking technique – I wish I could get the hang of it…. Bright colors are great and so is your card. Love the cards popsicles are one of faves! You have THREE winners, here!!! Wonderful cards all three are so fresh and fun. That stamp set if so cool! I love it and I love your cards – thanks! Each card is so different – what a great way to showcase the stamp set and the variety of ways it can look. Great cards. Each are so different and fun. My fav is the 2nd one!! Thanks for the inspiration!! Your cards are such fun and who wouldn’t love one of these cards with a gift card to an ice cream shop during a hot summer day! Great job! Congrats, Gayatri! I love all three of your cards, but the second one is my favorite. lovin’ the popsicle cards. my fav’s the pastel colors! thanx for the inspiration and blog candy opp! Super SWEET cards!!! lol!! I love the brightly colored one!!!! Wonderful cards! Especially like the third one. So colorful. The Stay Cool stamps and dies are by far my favorite from the release. I love all of your cards! These are all beautiful pieces of art! I love the creamy pastel colors on the 2nd card. They look so refreshing & delicious! loved the cards but really loved the contrast on the last card. Great cards – fabulous coloring. Now I’m craving a popsicle! All 3 of these are great! The middle one is probably my favorite, though the last one really pops and makes me want to go eat a popsicle. Perfect for summer. Hard to pick a fave but the first one caught my eye (first, lol!) Who wouldn’t love a rainbow of popsicles all in a row! “Cool” cards and the variety of techniques really shows the diversity of this set. Thank you! Love your work. Beautiful coloring. All of your cards are so pretty and colorful. I really like the one with the popsicle strips. Very clever. Brights to pastels, love them all! All three are great but my fave is also the third. Love those bright fun colors. So glad you’re here to inspire. Thanks so much. Wow these cards are absolutely amazing! You are so talented. Those popsicles look so inviting! All these cards are wonderful. The last one is my favorite. So fun and colorful. Thanks so much for sharing your talent. I love both of these cards. The soft pastels are so relaxing and the bright one reminds me of summer adventures on the lake and lots of sunshine. Great cards. Your cards are gorgeous!! I love the lighter ones & the bold one is just phenomenal! Great job! I didn’t think I needed this set until I saw your cards. They are so cute! Each card is so different. My favorite is the one in the middle because they remind me of my favorites that were colored on the outside and vanilla on the inside. Yum! Love how you used different techniques to make each card different! They are all so pretty. Great cards! Looking at all those great popsicles on a hot summer day like today makes me wish the Good Humor Man still came around. 🙂 Thanks for sharing your great ideas! I really like your style. I hurried over to follow you on instagram. Those treats on a stick make me hungry for something icy and cool. Great job! Oh my gosh your work is beautiful!!!!!! Fantastic release! Such a variety! Like them all. Your cards are so bright and cheerful, great summertime cards! Love all the cards, especially the brightly colored one. I love the Popsicles…all of them!!! I loved ALL 3 of your cool treat cards. Wonderful coloring on all of them and thank you for the different ideas on how to use the stamp set. Great job! So happy you were hopping along today. I love all your cards, they are unique and so pretty!! Beautifully embellished, I’m inspired! Best use of the popsicle stamps and die yet! I didn’t think I wanted this set until I saw your creations! Love. Love all three of your cards. My favorite is the second one. Thanks for the ideas. What an amazing showcase of these stamps and dies! I so can see why the vibrant bright colours of the last is your favourite, but I’m rather taken by the rows of mini popsicles on the first, just fabulous! Great cards, I love them all but agree my favorite is the bright colors as well. The lightly water colored one is a close second due to it being different. Thanks for the ideas! Love the inspiration and adore the artsy 2nd card! Very cool! LOL Thanks for sharing! So delicious!! Love the one with the bright turquoise background! I liked seeing a card done in pastels. It broadens my mind! Really loved the popsicles in bright multi colors! Just look at all these adorable popsicles! showed off the sets and dies well. Beautiful job with the Popsicle. super cool and fabulous cards!! Your cards are wonderful! I see why you like the last one the best – those colors are marvelous! Thanks for sharing! All three cards are such clever designs and colored beautifully. Thanks for the wonderful inspiration! These are so cool! Last one is my favourite. Can’t wait to get chilled too! I love these cards! Fabulous! Love the bright summery cards, gorgeous watercolouring. Such cute cards! The third one is also my favorite. All of your cards are awesome. I love the colors. The layouts. I do like this stamp/die set. I have it on my list but now I even know more I will purchase this . Thanks for the inspiration. I am crazy about the last one, with blue background those popsicles POP!!! Thank you for the inspiration! I love how the cards really gives a summery feel. Love your ideas. I really love the way the popsicles pop on the page when you cut them out. They look really neat. Fabulous cards! I love the variety of cards with same stamp set. Thanks for the inspiration. WOW! Love the popsicle set but that little row of pops is Awesome! Thanks for the great ideas! Love your cards, they are so cheery, especially the you’re cool card. I love the details on your second card! I’m partial to the last card. Bright colors make me smile! The pastel popsicles caught me eye and then…there were the bright colored ones. All of the cards are “cool”. I like the sentiments in this stamp set. I love the masking technique and blue background. Definitely going to give this a try. Card 3 is my favorite as well. Thanks for your inspiration. 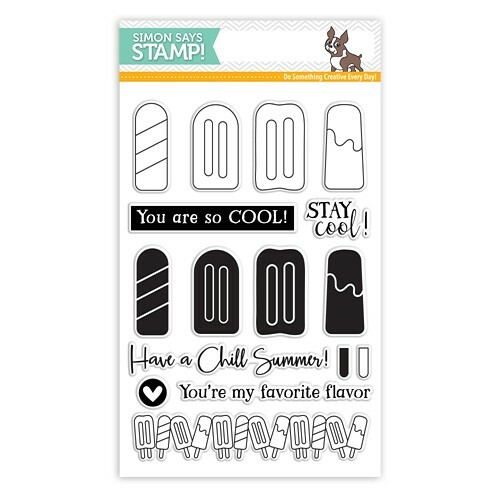 Can’t wait to get my popsicle stamp set!! Congratulations on your first hop! And what a great start! Your talent brought these stamps to life. Just looking at the colors you chose and how well you blended them, make them seem like they could melt, right down, and drip off the paper. Super summer card set! Wow, you blew me away. Thank You!! Great cards. I love that you have a completely different style for each one. These are all so fun! That bit of navy ink on the last card really does add a lot – I’m going to have to try that. So cute, i love those popsicles. I like all 3 cards, but the 3rd is my fav–so colorful. Love the contrast of bright and pastel colors and the variety of ideas. Both are wonderful. Very cool cards, they are all great. So enjoying this new release and the inspiration. Thank you. I love these cards!! They just make me happy!! All the bright colors are just uplifting!!! Makes me want a popsicle really bad!!! Haha!! Thanks so much for sharing!! What super cool and colorful cards you created, Love them! thanks for sharing. I love your cards,esp. the last one! I love bright colors too. Beautiful cards, thank you for the inspiration! Perfect summer cards Gayatri, especially with the weather we’ve been having here in the U.K. just lately! I think they’re all lovely, but that last card with the gorgeous blue background is a particular favourite of mine. Great contrast between the background and those lovely rainbow coloured ice lollies. I admire your ink blending skills, too! Thanks for sharing all this great inspiration. All very cute, but the third card with the bright colors is my favorite too! Cool cards! Now I am craving a popsicle ! Hi Gayatri, Love all of your cards! I think my favorite is your second card! I like that the set is very versatile! 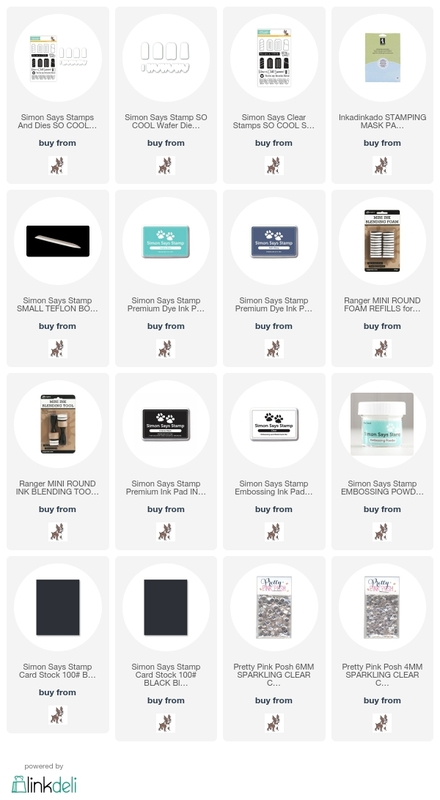 Congrats on your first blog hop from SSS! Love all three cards! The bright colors of the first and last cards are great but I also like the softer feel of the second card. Beautiful coloring! Thank you for the chance to win! What great cards! They are all so different and I love them all! I really love all three of your cards! They are all super cute and scream yahoo it’s summer! Cute summer cards! Thanks for sharing! Such creative and fun cards – perfect for summer! Thank you! These cards are beautiful. I love how you got such a different look on each card. The colours on all are amazing. Thanks again. Love them all – great summer cards but the border pops is my favorite ! Beautiful cards!So different to each other and so inspiring!Thank you for sharing! Great cards. You can never have too many popsicles! I love the colors you have used. I just love all these popsicle, just too yummy! Thanks for sharing with us. Thanks for sharing your beautiful cards. Love all your ideas and designs. I love your love of color. This is sooo cool! Loving this release and hop. Three super-duper cards, but my No. 1 would be the lovely pastels. Wonderful cards! My favorites are the ones with the bright colors! They look so much like summer! Your cards are all lovely! I like the colors on them all especially the cream cool colors and then the vibrant colors on the last two cards. Such a summertime feel to them. Thanks for sharing! Oh I love your cards! Congrats on the blog hop spot! Well deserved! Three fantastic design to show off the popsicles! All three of these are fabulous! I especially love the soft colors on the second card! TFS! Love the different techniques you used to get three different looks! Great job! Love the different techniques you used to get three different looks! Can’t wait to try them! Lol! True Risa! Thank you for your lovely comment. WOW your cards are wonderful!! Love them and this new release!! Love how you used the stamp set in different ways! The bright card and the pastel card are both amazing! Great cards, love the repeating Popsicle border! I love all three. Great to see different ways of using one stamp and coordinating die set. Thank you. Beautiful cards. I love all three. Great to see different ways of using a stamp and die set. Thank you. Love your cards. I think the last is my favourite as well but it was hard to choose! These are great! The second card is my favorite. I love the colors and crystal drop accents. First time visitor… sooo much yumminess in all your cards. Can’t wait to see more. I subscribed. Great cards for summer now I want ice cream. So many ways to use the Popsicle stamps and dies. Thanks for the inspiration. What a great set of summer cards! Such fun creations, perfect for summer! I love all three cards…but the first is my favourite. They are all chill! Each one of your cards just got better and better. I loved the pastel version but then I saw the full color version, . All extremely well done. Awesome cards! Love this stamp set! The bright color card is my favorite! I love you coloful cards, especially the second “artsy” one! Cute cards! Great stamp set & dies! Ok, these cards are WAY TOO CUTE!!!!! Love all three of your cards. But, I have to say I like the third card the best. Love how you showed different ways to use the same stamp set. This is a wonderful release! I love your cards. Love the cards and this release is fantastic! I didn’t order the popsicle set,rethinking that after seeing your great border card. Love your cards! So summery and colorful. All 3 of your cards are wonderful – I don’t know how you could have chosen one as a favorite! All three styles are fabulous! I’d be hard pressed to pick a favourite tho the second one has a cool frosty look that’s especially interesting. Love them! I LOVE all three cards; the best of the hop! I think I need this set. I couldn’t pick a favorite if you asked me to. They are all so great. Wow, I didn’t even consider this stamp set until I saw your cards; especially the pastel one. Love your ideas! Fantastic cards. I especially like the 2nd card with the softer colors. It looks so frosty cold, then again I love bright colors and your last card is luscious. Love these awesome cards! My fave is the 2nd one with the softer colors, (maybe because they look like ice cream might be added to the popsicle! ), but all three are spectacular! Really cute and cool treat cards. Very nice. Love the pastel popsicles. Looks so cool and light. Love the colors on the second card. I had to check your supply list to see what you used!! I have the Zig markers!! Off to see if I can make mine so soft and beautiful too!! Love the dimension on the first card and the watercoloring on th e second. I am really considering getting some of those Zig markers and experiment with watercolor. I like your cool popsicle cards! Your cards are so cool! Love them all! Great stamp set, too. I too think my favorite is the last one but they are all really nice. Fabulous variety of cards using popsicles!! Thanks for sharing! Your cards are just the COOLEST! I love the soft colors on your second card….because I can never pull off soft colors! Your cards are so COOL! Each one was better than the one before! They all made me want a real one to cool me off after a hot day. Great job! soooooo FUN! such inspiration. . . These cards are adorable. I love how you got 3 completely different looks! Awesome Cards! Awesome release! I especially love the Popsicles done in pastels! All are wonderful!! I personally think the second is my favorite!? They’re all GREAT!! Lovely cards – my favorite is the “artsy” one. I think these are my favorite cards!!! You did a great job with all of them! Love the colors both the brights nod the subtle of the watercolors. Thanks. Wow! Awesome. Love, love, love the border popsicle card! Wow! 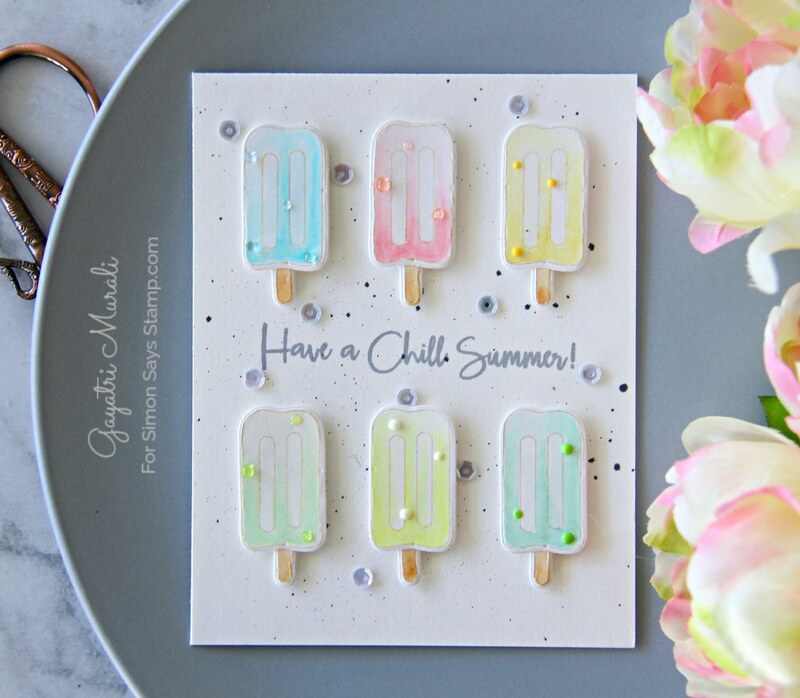 These are all gorgeous…..but I love the second one with the soft water colored popsicles! Great cards! You make me want to buy this set!! Awesome designs, love all your cards, thanks for the inspiration! Thank you for showing us how versatile this set can be! I can’t decide which card I like best as I was already thinking “yummy” with the first card done in sherbet colors! Fabulous release! Love your yummy, cool cards. Wonderfully done. Love the final card, what great colors. 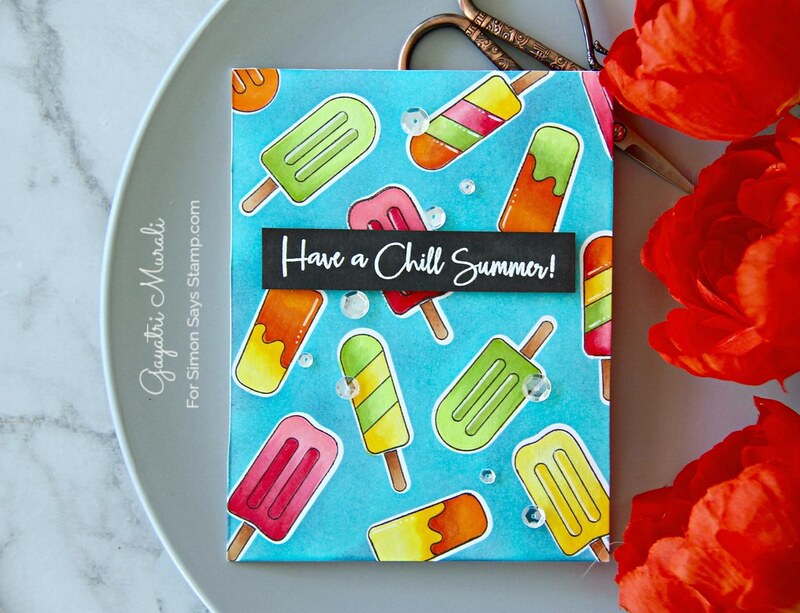 Such fun colorful summer cards – love this new release from SSS. Great cards, especially the bright third one! Such vibrant colors! These cards are gorgeous! Love the second one, how soft it is. Now I want a popsicle! So cute! Love all the popsicles! Beautifully done cards. Thanks for sharing them with us. I really love your cards. All three are so different, but each so beautiful. I agree with you, I like the colors in the third card the best. You do such a good job witht the colors! Thanks for the inspiration. Very nice assortment … thank you! Beautiful summery cards. Thanks for sharing! All 3 cards were fantastic. I couldn’t pick a favorite. They are all so unique. My favorites are the 2nd and 3rd cards. I love the 3rd, because of the bright colors and composition. I love the 2nd because of the soft colors. It was unexpected and a pleasant surprise. MY MY…. What fabulous cards!!! I sure do wish i had one of your pop-cycles here right now!!!! These pastel popsicles are so pretty. Yes! Yes! Yes! I LOVE this stamp and die set and your cards are so creative! I, too, enjoy bright colors! 3 great cards! Love how they are all so different. The third one reminds me how much I love eating popsicles as a kid – so colorful! Great blog hop. Such beautiful cards! Despite it being winter and very cold here, I’m longing for an ice block or 2 right now! I never knew popsicles could be so stunning!! I hope you decide to make a video of your coloring techniques! I especially like your muted, mostly white, popsicle card!!! I can’t wait to mimic it!!! I love the bright colors on the last card….spectacular! You achieved three totally different looks, I do have to say I love the last one too, the colors are perfection! They are all beautiful in their unique ways. I love them all! Thanks for sharing! Even though its the middle winter ( in Aus) I am definitely feeling summer love with your 3 different , but all so pretty, popsicle cards. Thank you for sharing. The pastel version you made is stunning! Such beautiful, soft colors! Love it. I love how each card is so different from the others! The pastel version is my personal fave! 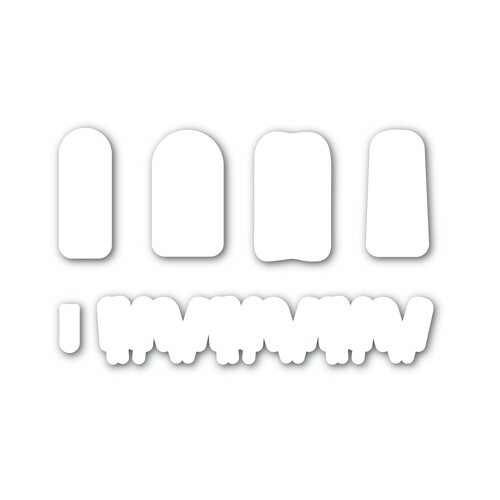 This is a cool little stamp set, i like what you’ve created-with it. 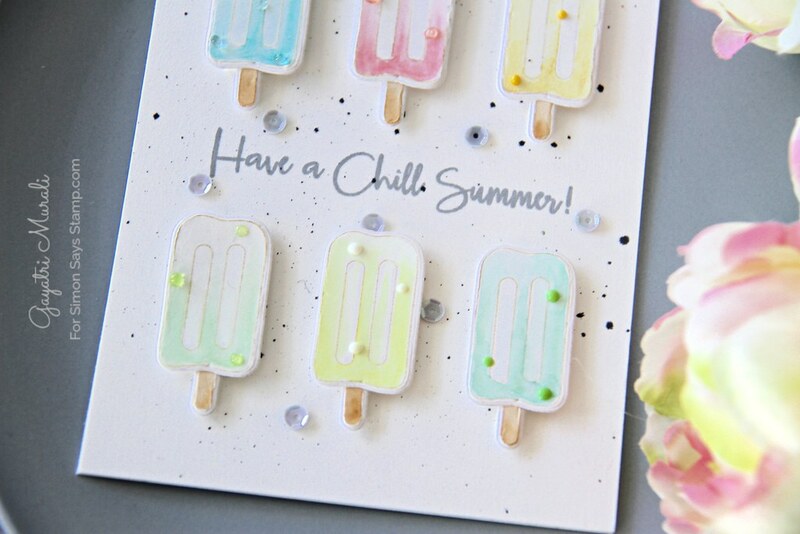 Great cards, I especially like the pastel die cut popsicles! I love your popsicle cards!!! So super fun and cute. Love the contrast of colors! Love the pastel colors. I think that’s my favorite. Love the yummy and summery cards, very cool designs – all of them! Always enjoy visiting your blog !!! 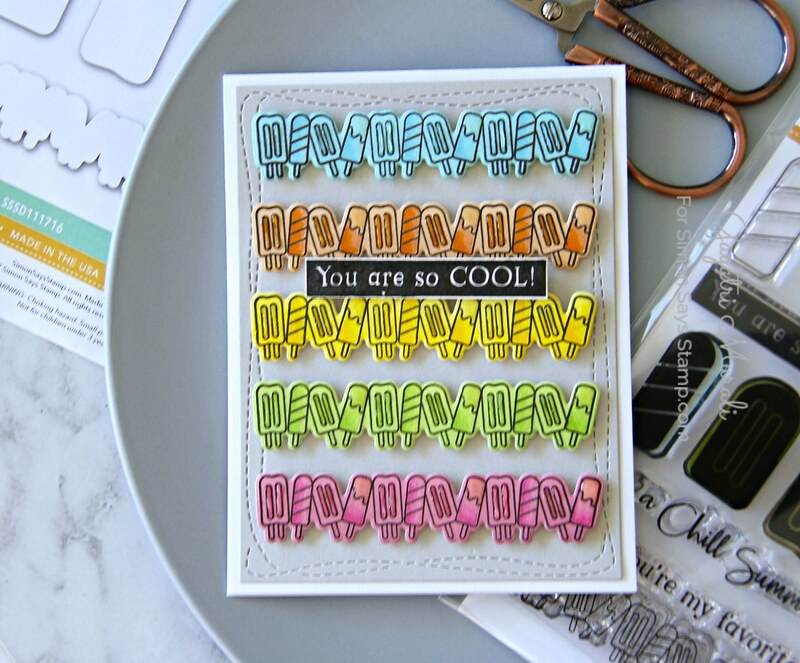 Fantastic ideas with this new One of a Kind So Cool Stamp and Die set! I have over 20 nieces and nephews that are so busy during the summer months and think this would be a wonderful surprise in the mail to let them know their Aunt was thinking about them! Great cards. The last one is also my favorite. Love the Copics coloring. I love all of the yummy and fun cards!! Creative, Cute & Fun! Just love what you did with the pastel colored popsicles. Truly “chill”-y. Beautiful cards and all so different. Cute, fun, bright, soft and everything in between. Nice work. Wonderful cards…..with the heat wave we’re having, receiving one of these cards would be delightful! Its so weird~ Kansas is usually really hot in June and its been in the low 80’s the past few days. It will be in the 100’s again in a few days. Feel worried for those on the west coast, they’re just not used to heat like this. LOVE, LOVE, LOVE all the Popsicles~! I think the last one is my favorite too because its so vibrant! Adorable cards! Not sure which one is my favourite! Thanks for sharing your creativity!! I loved the pastel colors of the second card. You are so talented!! I don’t usually do blog hops, but I am so glad I did. The way all of you use the same supplies differently is so helpful. I am inspired to get out my stamps and experiment more. Really nice cards and your coloring is wonderful. The colors are so pretty, from bright on the first one to soft on the second. Thanks for sharing. I am in love with the pastel/neon ice creams! They are so cute! I love them all! So much inspiration! love to watch your techniques. Awesome cards. Variations, spellcheck failed me, lol. I’m too late for the giveaway, but want to let you know I love the bright colors of your popsicle cards and I really like the chilly feeling you achieved with the frosty colored second card. Even tho’ I have missed the deadline for the giveaway, but want to let you know I love the bright colors of your popsicle cards and I really like the chilly feeling you achieved with the frosty colored second card. I love all the 3 cards you made. But I do agree that the last card is fabulous. 3 very different ways to use ice creams, they all work great ! Thank you for tips and inspiration! Your Popsicles really Pop! Lovely cards! I like the way you used the same set and made three very different cards! All beautiful, thanks! This is a great collection of such uniquely created “cool” cards. The possibilities are endless. Thanks for sharing them on this blog hop. Great cards. The popsicles look so yummy makes me want to go out and get some popsicles at the store. Very nice cards. It’s great to see three different projects with the same stamp set. Love your second and third card !! Super cute cards! I love all the popsicles and all the gorgeous colors! Thank you for inspiring! Loved your cards. Loved how they all were so different!!!! The summery colors are so intense, yet the more “artsy” card is totally chill. Love them both. You have quite a range! Well, I’ve just eaten the last popsicle I had in the freezer…. And now, seeing your lovely cards, I feel like have another one – LOL ! I’m absolutely loving this popsicle set. I can see why the third card is your favorite. The colors are so vibrant and cheerful! The other cards are wonderful too. Your examples show how you can do so many different things with this set. Love the cards, I think the pastel one is my favorite, it just gives off a chill. Wow! So impressive and love the different card styles, especially the one done with Distress inks as I so enjoy working with these inks. So happy that there are dies as I’m not a big fan of fussy cutting. I got the summer filings by looking on your cards, so pretty coloring. Amazing cards the middle one is my favorite!! All three cards are amazing. I think I like the second one best because of the no-line look, which, combined with the splatter, makes the card look super artzy! Yummy cards! I can’t decide which one I like the best. I’ll go eat a popsicle and get back to you later…lol! So cute and fun! Thanks for sharing! Your cards make me hungry. Popsicle sounds good right now. Thank you for sharing. Love all these cards. Lots of ideas for the popsicle stamp and die set. Love how you used the border die. Beautiful cards. Thank you for sharing. I love what you’ve done with all three different designs. So hard to pick a favorite. Wow! Absolutely gorgeous cards! You have made me look at this stamp set in a totally different way! Such fun cards and all a different look! I too like the colorful one. Love the cards! Now I’m ready for a popsicle!! Very summery! Another great release from Simon! Thanks for sharing . Congratulations! Your cards just SHINE! Each Variance is Amazing and so fun and Beautiful! I love the pastel-ish card!! So pretty and reminds me of vintage summertime… 😊 TFS! Super fun and summery cards! Congrats on being a participant on the blog hop. Your background is fantastic! all your cards are fantastic! thanks for sharing! These are all so fun! I love how you’ve colored each of them. So cool! Thanks! Love that blue background! Fabulous cards! I love the colours in the first and third the best but I also like the second one as the soft colours make it look like they’re creamsicles or yogurt barss. I’m loving this set! I love what you did with the die cut line of popsicles, but the third is definitely my favorite with the bright blue background. Love the SO COOL sets. You’re cards are so refreshing. Thanks for sharing! All three cards are fun, but the middle is my favorite. The soft colors look refreshing. Cute stamps and dies! I really enjoyed your work. you had a unique perspective. Super sweet and yummy cards!! One of my favorites. I love everything you have done. way to take the same set and make completely different styled cards! I love your cards and the Popsicles are adorable. Just perfect for hot summer days. Beautiful coloring whether in pastels or brights. I love your ‘have a chill summer’. that is a great card!! !